Well, the kids had a week off so we left on the Sunday of Presidents' Day weekend to ski at our beloved Dodge Ridge Ski Resort. This time I planned far enough in advance to stay at the Pinecrest Lake Resort (www.pinecrestlakeresort.com), a collection of rustic 2 and 3 bedroom townhouses, 2 and 3 bedroom cabins and motel rooms walking distance from Pinecrest Lake itself. 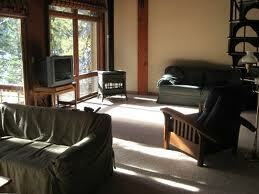 All the townhouses and cabins have cable TV, linens and full kitchens. The townhouses also have gas fireplaces and dishwashers. The townhouse also does appear to have a sofabed allowing it to sleep two more people. The motel rooms have two queen beds, cable TV, and daily maid service. Those staying in the cabins and townhouses are asked to complete some very light housekeeping duties prior to departure, like take out the trash and strip the beds, so it's really light. My family of five always stays in the two bedroom townhouse. It's not like there is easily accessible food around Pinecrest Lake in the winter. Being able to cook to us is essential. The staff at the front desk is always warm and inviting and seems to remember us as we come each year. There is parking in front of each townhouse unit. There is supposed to be one spot per unit, but as some of the units are three bedrooms, you can see how one unit might wind up occupying two spaces. For a short time we had no space to park, but this was quite short lived as a car or two departed for dinner or the grocery store. We had no additional problems with parking. In all truth, you are not even supposed to park there during the winter, because they want to be able to plow it, but this has never been enforced in all the time that we have been there. The two bedroom townhouse unit has very basic but adequate furnishings. There are two bedrooms upstairs; a master with a queen bed and another with two twin beds. There is also a sofabed downstairs which my daughter said was uncomfortable, so she wound up sleeping on the unfolded couch for two nights. The bathroom is also upstairs. There is a gas fireplace downstairs which provides some heat but very little ambiance. There is no woodburning in any of the units. One of our biggest complaints about this place in the past was the lack of a decent television. It was a tube TV barely 20 inches that was so old that you couldn't even plug in a DVD player and watch your own movies. We were happy to see that our unit was now equipped with a 27 inch flat screen TV! Hurray, PLR! Ah, but alas, the living room design is not conducive to a wall mounted TV. The only place to put it was on the wall opposite the living room sofa—about 20 feet away! You would really have to pull hard chairs up from the small table and the kitchen to get closer and really watch the TV. We wound up watching our own movies again, huddled around our computer which we put on the coffee table. The kitchen is spacious and well lit, but poorly equipped. One nice addition this year was wine glasses! The kitchen had no pasta server (who doesn't eat spaghetti on vacation?? ), no salad tongs, no blender, and not one covered pot (good luck making rice!). We bring our own non-stick frying pan. There are only enough dishes to get a family through one meal, which means it is likely that you are running and unloading a half-full dishwasher twice a day. There is no ice maker (ice trays only) and no garbage disposal. The outside has a deck with a spacious picnic table and the upstairs bedroom has a balcony, which of course we have never used, since we only have come in the winter. There is no cell phone reception if you are with AT & T. Wi-fi is available for 11$/day or 5$/hour. C'mon guys—just provide it. I think this is nickel and diming. One thing that does bear mention is that all five of us had showers after skiing and there was plenty of hot water. 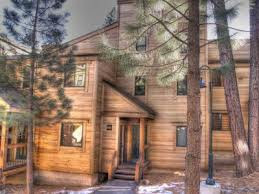 Pinecrest Lake Resort has a reservation and cancellation policy unlike any other. During peak times (winter and summer), the last day you are allowed to cancel is 60 days in advance. I'm lucky if I've gotten organized enough to make my reservation that far in advance! After 60 days prior to your arrival, if you cancel you are required to pay the amount IN FULL, unless the unit rerents, minus the 25$ non-refundable deposit. We find this to be a huge deterrent in booking here. It is possibly the strictest cancellation policy I have ever encountered. For $275 a night you get sparse furnishings, a poorly equipped kitchen, a lame TV, a lame fireplace, no internet access, and heaven forbid you need to cancel. No brainer, right? Well, the truth is the jury is still out! About a month ago, we stayed in a VRBO rental in Cold Springs, which cost us a hair less and was bigger. I asked the kids where they liked staying better and the vote for Pinecrest Lake Resort was unanimous. When I asked them why the only great reason they could come up with is, "It's just cozier!!" It IS cozier, but in addition there is tons of floor space, so there is plenty of space for our stuff. Linens are provided and there is garbage service. The closets and drawers are empty and available to use instead of being full of the owner's stuff. Once we learned what the kitchen was missing, we just made a list and brought it. You also can't beat the walk to dinner and the 10 minute drive to the Dodge Ridge Ski Area. I think in the summer, especially if you are not a camper, this resort's close proximity to Pinecrest Lake and Marina would make it quite worthwhile. (However, do beware, because in the summer the cabins and townhouses only rent for a week at a time!) In the winter, I think it's overpriced, and the cancellation policy is ridiculous—but it still seems to be the accommodation of choice for this GoFamily. I would still be willing, however, to take another look at VRBO…. No GoFamily trip to Dodge Ridge is complete without a stop at Heidi's Ski shop (www.heidisskishop.com ). 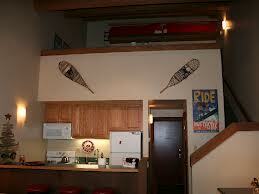 ---To avoid having to roll out of bed early and drive, rent your skis the night before at no additional charge. ---Did you know that Heidi rents stand up paddleboards during the summer?? Buy your season passes for the 2013-2014 ski season now at a discounted rate! Season passes are now through April 7th for next year's ski season! Adults/Teens are $299, children are $99, and seniors are $129. It seems that with a season pass an adult would have to ski 6 days at Dodge Ridge next year to make this deal worth it. Even at this discounted rate, we are not buying season passes. Dodge Ridge introduces Riglet Park for beginning snowboard riders! The Burton sponsored learn to ride program introduces 2-5 year old to the sport of snowboarding. $96 includes two hours of one on one instruction, lift ticket, helmet, and equipment. Is there anything else to do in the area? Well, it just so happens that we came to Dodge Ridge last year and there was NO SNOW, which meant NO SKIING. So we did wind up spending some time at the Long Barn Ice Skating Rink (www.longbarn.com), located at 25957 Long Barn Road in Long Barn. This is another one of those places with very limited hours. On Friday nights it is open from 6-9pm, Saturdays from 10am-9pm and Sundays from 10am to 6pm. Otherwise, it's closed, except for Christmas vacation and President's week, when it is open from 10am to 9pm and MLK Day 10am-4pm, so in general, midweek you are out of luck. When we went we pretty much had the place, an indoor rink housed in a barn, to ourselves. There are buckets available for the little ones learning to skate. Skate time plus skate rental costs $10 and that is per day, so you are welcome to go home and have lunch or dinner and then come back again. Long Barn ice rink is associated with Long Barn Lodge. You actually pay for skating at the lodge's front office. Thank you for reading this post! Stay tuned to hear about GoFamily's trip to Scottsdale, Arizona for a dream come true weekend watching the San Francisco Giants at Spring Training!! It's Heidi's sign, but it might as well be mine!!! What is Northstar at Tahoe?? Northstar at Tahoe is a ski area located in the North Lake Tahoe area. Northstar has (when everything is open, of course) 19 lifts, 93 trails, 7 terrain parks, both an 18ft and a 22ft superpipe, and 104 "features" (some nice snowboarder can fill me in here on what "features" are ). The mountain includes a wide variety of terrain for skiers and snowboarders of all abilities. In 2008-2009, thirteen million dollars were invested into the betterment of the mountain, including the construction of the Martis Express quad chair, serving an additional 414 acres of blues and blacks on the far side of Lookout Mountain. 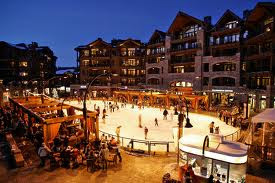 Northstar is associated with "Northstar Village," a complete promenade including high end shopping, dining, accommodations, and the all important Starbucks. For more info try www.northstarattahoe.com. Where is Northstar at Tahoe? Access from the Bay Area is from Interstate 80 East to Highway 267 through the town of Truckee. The nearest towns are King's Beach and Truckee. Northstar's website boasts a three hour ride from the Bay Area—but in my opinion this is if you are considering Fairfield to be part of the Bay Area. Okay, well the first disclosure is that I personally have not stayed at Northstar for about 16 years, before Northstar Village was even built. My references come from our friends who just stayed the weekend of January 31-February 3, and from a lot of additional research. The unit sleeps 6-8 in this arrangement. Two queen beds are in a loft above the kitchen. In the loft itself, there is a ladder that accesses two twin beds—so basically 6 people could be sleeping in the loft, that's tight. There is also a pull out bed downstairs. This is why I always advise to assume the unit sleeps the minimum of the range listed. But the price is the real kicker. Get ready. On a Friday or Saturday night during the winter, this unit rents for $429! $429!! Sunday through Thursday you get a break-350$ per night. 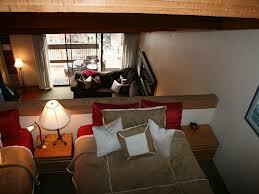 Christmas and ski week the price per night is even more than $429. For $429 I better have my own bedroom (and maybe someone there to rub my feet and cook my meals.) The cost of a three night stay over the weekend is going to run $1208—which may not include taxes. In a million years I just can't say that I get it. I mean, no standard room is worth one thousand dollars a night! I'm not even going to even compare prices with this place because it's so off the charts for the average GoFamily family! 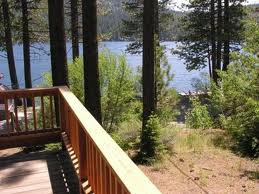 I would rather overlook Donner Lake than Northstar Village! By staying in the non-resort based accommodation instead of the Northstar Village loft condo, a family of four to six would have saved $690 dollars on accommodations alone over three nights. "But, but, but," you may say, "I want to be right there! I don't want to drive! Once my car is parked I don't want to look at it!" Well, it's going to cost you but there are still more reasonable and valuable options. VRBO property #387753(www.vrbo.com/387753) is a 3 bedroom 2 bath Northstar condo that sleeps six. There is no cleaning fee, no resort fee, no parking fee. This property will run you $325 nightly during the winter. It has all the amenities that the Northstar Village loft has, just a lot more space, including sleeping privacy for mom and dad—something I personally think is critical when you are spending this type of money. For a mere two dollars per person, you also have access to the pool, the hot tub, and the fitness center in Northstar Village. Access to Northstar Village is by a free 5 minute shuttle ride which runs continuously during the day. It's not ski in and ski out, but neither is in drive in and drive out, if that's important to you. A lot more space for less money, and still at Northstar! By staying just outside of Northstar Village, a family of four to six would have still saved over 300$ over three nights on accommodations alone. You can get a discount on your ticket (10$ off adult, 4$ off teen, 7$ off child-why less off for teens??) if you buy it online three days before your arrival. Of course a multiday ticket is a better deal. A multiday pass purchased at Northstar can be used at both Heavenly and Kirkwood resorts as well. A multiday ticket purchased at Kirkwood can only be used at Kirkwood and a multiday ticket purchased at Heavenly can be used at Heavenly, Kirkwood, and half the days of the pass can be used at Northstar. That's confusing. Incidentally, on high season days, such as MLK weekend, Northstar raises the prices of their lift tickets. That's lame. If you think you will ski enough, a season pass may be the way to go at Northstar. We heard from other friends of ours (also visiting Northstar during the upcoming President's week) that it only takes about 5 days of skiing to cover the cost of a season pass if the season pass is purchased on special the season before. By buying my tickets online and in advance, my family of five will save a total of $76 over two days of skiing. Northstar has a variety of ski equipment rental packages available. The everyday run of the house skis are rented for 52$ if you are over thirteen years of age, 32$ if you are between the ages of 3-12. (Interestingly, 3 and 4 year olds ski for free, but their equipment is not free!) Renting over multiple days will lower your average daily charge. Adults can rent "performance" skis for 60$ daily and "demo" skis for 72$. My suggestion—find a place in nearby Truckee as you drive in or rent your skis at home. These exorbitant prices plus the lines and crowds you will have to deal with renting at Northstar are not worth it! In Truckee try Tahoe Dave's Ski and Boards (www.tahoedaves.com). A basic adult or child ski package is 29$ and you even get a 10% discount if you make your equipment rental reservation online. Black Tie Ski Rentals (www.northlaketahoe.blacktieskis.com) is more, but will deliver your equipment to you! By getting my ski equipment at Tahoe Dave's instead of at Northstar, my family of five is going to save $179 over a weekend of skiing. When I skied at Northstar in the days of the fixed double chair, lift lines at Northstar could be ghastly! Many lift lines even mid week could reach up to 40 minutes. I also really hated that at Northstar the lift operators would always fill the "empty spot" on the chair, forcing you to ride with a stranger. I found this a little creepy as a kid. Well, though the operators are still going to make sure that every chair destined for the top of the slope is full, the word on the street is that because of the speed and capacity of the lifts, (there is even a "six-pack" chair now!) lift lines are less of a nuisance. I would love some comment on this!! There is absolutely no doubt that taking your GoFamily to Northstar to ski is going to be considerably more expensive than taking them to our beloved Dodge Ridge. However, if you make some good choices in terms of lodging, lift tickets, and rentals, it is possible for a family like mine to save more than $550 dollars. That, mind you, is still staying in Northstar. Almost like having your cake and eating it too! If you can skip the cake and stay in a nearby city, the savings can be considerably more. 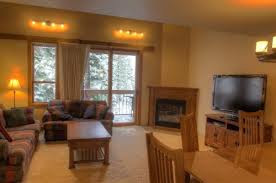 With rentals from Tahoe Daves, lift tickets purchased in advance, and staying at the Northstar Drive 3Br condo my GoFamily of five is going to spend $1968 for a two day, three night stay. The same trip at Dodge Ridge costs my family of five $1348, a $600 savings. Thank you for reading this post! GoFamily is on the road again next weekend back to Dodge Ridge for more skiing. A near future post will share the details of our return to the Pinecrest Lake Resort! VRBO.com is a website that boasts the listing of 190,000 vacation rental properties worldwide. VRBO stands for Vacation Rentals by Owner. Property owners around the world have listed their rentals on this website and all you have to do now is figure out where you want to go and search!! Our experience to date with VRBO has been stellar. We have rented a beach house in Aptos, CA, a three bedroom condo in South Lake Tahoe, a ski cabin in the Pinecrest Lake area and a gorgeous plantation type home in Hana, Maui. They have all been lovely properties and the process of renting these properties was lovely as well. Once you have rented a property through VRBO it is often possible to rent directly through the owner the second time. Many will keep your contact information in their personal files and inform you of changes to the property or upcoming deals. Many owners will even often discounts to repeat renters. There are filters you can use to narrow your search to exactly the type of property you are seeking, but I find them to be a little silly, as you can't filter for things that I consider important, like properties having a dishwasher or linens provided or parking-so my recommendation is to only filter your search by location, minimum "sleeps", and dates of availability. Know where your center of activity will be and know what that place/area is called. Look for properties near that center of activity. For example, the towns of Lahaina, Kahana, Napili, and Kapalua are all listed under the heading of "West Maui." If "West Maui" is where you want to be, you better know where! If the busy night life of Lahaina is important to you, you may not want to be driving in from Kapalua each night, as Kapalua is about a 20 minute drive. Better to stay in the town of Lahaina itself, and WALK to your nightlife destinations. For this you must orient yourself to the area. Try Google maps or any guide book about your destination. Get the exact address of the potential rental and look it up on a map! Just because a property's mail routes through a certain post office does not mean the property is actually in that town. Our rental in the Pinecrest Lake area had a Long Barn, CA address; however, the property was in Cold Springs, CA—about 10 minutes closer to Dodge Ridge! Our Hana rental was listed under the "Hana" heading, but the property was actually in Nahiku, about 7 miles up the road! No big deal, but it did mean we would not be walking to AM snorkeling in Hana Bay or walking home from dinner after several Mai Tais. Incidentally, nearly all Kaanapali Beach rentals have a Lahaina address, though Lahaina is 8 miles south of Kaanapali. When a property is described as sleeping a range of people, assume it sleeps the minimum number. Find out from the owner the exact arrangement of the beds and bedrooms. Our friends are in a condo this weekend which sleeps 6-8, but that's with two twin beds and the 2 queen beds all in one open loft, which means the whole family is sleeping in one room. Our latest rental said that it slept 6-12, but boy were we surprised to see that the queen bed that was advertised was actually a futon in the master bedroom with the king size bed. Our poor friends, with whom we shared the house, were forced to share a full size bed in a bedroom with another full sized futon with their two sons! We were quite tight with nine. You can also pretty much assume that the last two spots of the maximum number are on some kind of pull out in the living room with offers no privacy and lacks much comfort. If you are sharing your rental with another family, you will need to consider the sexes and ages of your children and if it is appropriate for them to be sharing a room. Another huge consideration for occupancy is the size of the hot water heater! If your rental supports 10 sleepers but does not support 10 showers after a long cold day of skiing, what really is the point? Again, in our last rental, only six of us were able to take 5 minute showers and shower takers 5 and 6 had the water turn cold on them!! If something is unclear in the listing—ASK! ASK! ASK! VRBO owners are obligated to get back to potential rentals within 24 hours. Ask as much as you want! It is your money, who cares if you are pestering the owner? Don't assume anything from the listing. If you do not see the words, "linens provided," do not assume they will be there! Does "linens" include towels? Is bath soap provided? Is there garbage service to the unit? Is there light if you arrive in the dark? Is the TV compatible with an external hookup like a DVD player or an Ipad? Is there cell phone service at the property? Is there a pancake griddle? Is there a garbage disposal? Is there a binder in the facility which tells you what to do in case of an emergency? ASK, ASK, ASK, and ask whatever you want! Check out the pictures—be wary of a place without plenty of pictures! Read the fine print in the RATES section. Now this can be a pitfall! You are all ready to rent your cabin at 200$ per night, but oh, you neglected to read carefully and now because you are there on a weekend during the winter, your cabin really costs 325$! Owners will frequently list the least expensive rate first because they know it will be the first thing you see. Beware of hidden taxes! Many counties charge some kind of occupancy luxury blue moon on Monday taxes that can raise your rates upward of 10% or more!! And beware that cleaning fee! We have friends that list their rental through Lake Tahoe Accommodations and the cleaning fee is 385$! Wow! If you are there for four nights, you have just raised your rates by 100$ per night. No family of five makes $400 worth of mess in four days! Make sure you understand the cancellation policy. Some renters will let you cancel with a full refund even a few days before; some will start issuing a penalty if your cancellation is within 90 days of your arrival! These points being made—I am a firm believer in VRBO and find it is FAR better to stay in a rental property than to get a hotel room. We have stayed in studio hotel rooms which cost only slightly less than a rental. Can you trust VRBO? Like anything, I suppose in would be possible for scams to be set up through VRBO, but so far our experiences and the experiences of our friends have led us to the belief that VRBO can be trusted. GoFamilyGo says GO for VRBO!! This is GoFamilyMom signing off for now! 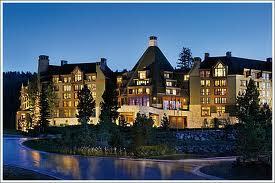 Be watching for a soon upcoming post featuring Northstar Village and Ski Area!